NFL players are no longer the only professional athletes to silently protest during the national anthem. 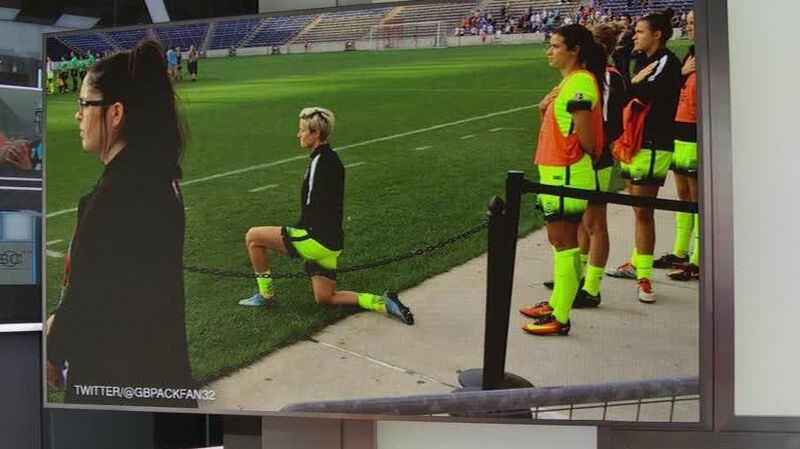 On Sunday night, women's soccer player Megan Rapinoe followed the example ofSan Francisco 49ers quarterback Colin Kaepernick by taking a knee during the playing of "The Star-Spangled Banner" before her Seattle Reign played the Chicago Red Stars in an NWSL game. "I am disgusted with way he has been treated and the fans and hatred he has received in all of this," Rapione told espnW's Julie Foudy. "It is overtly racist. 'Stay in your place black man.' Just didn't feel right to me. Need a more substantive conversation around race relations, & the way people of color treated." Rapinoe added: "We are not saying we are not one the greatest countries in world. Just need to accept that [it is] not perfect, things are broken. And quite honestly being gay, I have stood with my hand over my heart during the national anthem and felt like I haven't had my liberties protected, so I can absolutely sympathize with that feeling. 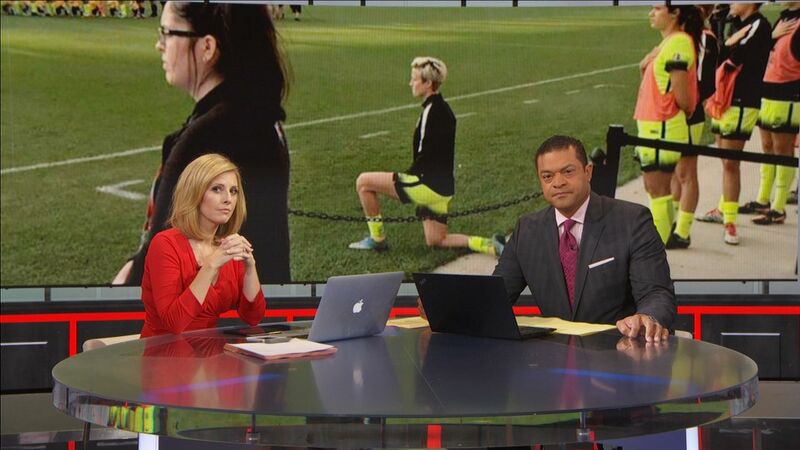 Rapinoe said she will continue to kneel in every match going forward. "The very least that I can do is continue the conversation with him by kneeling for the anthem," she said. Rapinoe, a World Cup and gold-medal winner with the U.S. women's national team, becomes the first nonblack professional player to join in protesting during the national anthem since Kaepernick gained notoriety for sitting out the anthem in 49ers preseason games. After sitting during the playing of the anthem during preseason games, Kaepernick elected to kneel during the anthem for the team's final preseason game on Thursday and was joined by teammate Eric Reid. In a separate game, Seattle Seahawks cornerback Jeremy Lane also elected to sit down during the playing of the national anthem. Though he has received backlash for his protest, Kaepernick has said it's not his intention to denigrate police, military or the country, but rather serves as his way of bringing attention to what he sees are failings in the United States' treatment of racial minorities. Kate Fagan says that by kneeling during the national anthem Megan Rapinoe opens and extends the conversation to a new audience and demographic in a more in-depth way. Kate Markgraf, Megan Rapinoe's teammate on the USWNT from 2006-10, says she isn't surprised by Rapinoe's decision to kneel during the national anthem and thinks it won't be an issue for U.S. soccer.